Noisy hotel. You could here everything in the hall. Cleaning crew in the morning to people returning at night and early morning. Centrally Located to the major attractions...... what more do you want! Hotel was extremely nice. The showers grout was pretty bad, however it was pretty pristine otherwise. I booked this stay on Orbitz. When I checked in they told me I had two reservations. It took some time to sort out and should not have happened. I booked two nights and that should have been one reservation, not two. Not sure where things fell apart, but please fix this. They downgraded me to a different room, telling me that it was an equivalent room rate. Later, the manager told me that their employee could not have known the room rate because they cannot see details on packages booked on Orbitz. So, the rude employee just wanted to get me processed and on my way rather than caring about my situation. I had paid for a deluxe King room with a view and got a very small room with no view to the city. The staff member advised us it was 40.00 per night to upgrade and could not give us a room because I had purchased it thru a 3rd party website. Our family members stayed at the same hotel with a standard double room got there later that evening and got a free upgrade to a junior suite with a city view for free. Very disappointed we were only there for a couple of nights on a getaway for my husband and I. Great stay! Did have an issue with the room key not working when I tried to get back into my room. Was resolved with a trip down to the front desk but it did delay me in the morning by about 15-20 minutes. Located in Downtown San Francisco, Hilton San Francisco Union Square is adjacent to SHN Curran Theatre and within a 5-minute walk of other popular sights like Powell and Market Cable Car Turnaround. This 4-star hotel has 1921 rooms and welcomes guests with 2 restaurants, an outdoor pool, and a 24-hour health club. Enjoy dining at one of 2 onsite restaurants including Urban Tavern, which specializes in American cuisine. You can sip a beverage at the coffee shop/café. For your convenience, a full breakfast is served for a fee each morning from 6 AM to 10 AM. A 37-inch flat-screen TV comes with satellite channels, and guests can stay connected with WiFi and wired Internet. The bathroom offers hair dryers and designer toiletries. Other standard amenities include a refrigerator, a coffee maker, and a laptop-compatible safe. 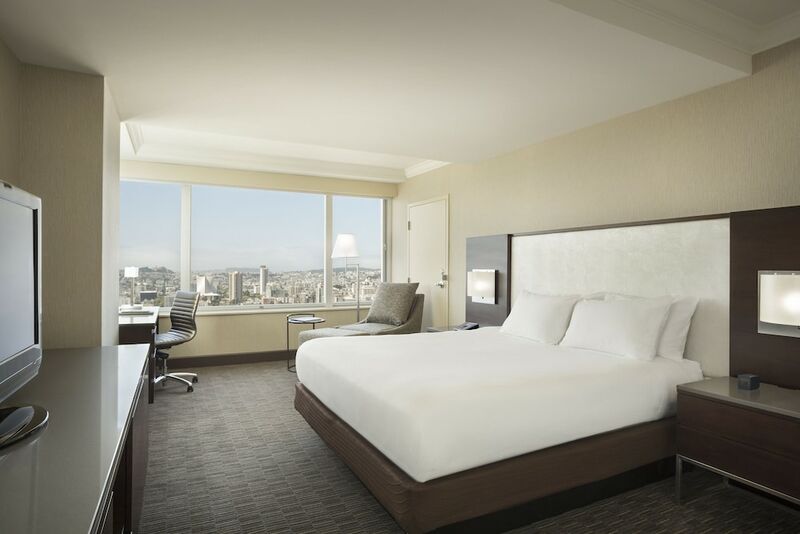 At Hilton San Francisco Union Square, guests enjoy features like an outdoor pool, a 24-hour health club, and free WiFi in public areas. Parking is available for USD 62.7 per night (USD 76 per night for valet parking), and there's also limo/town car service. The front desk has multilingual staff on hand 24/7 to help with tours or tickets, securing valuables, and dry cleaning/laundry. Additional amenities include conference space, a business center, and coffee/tea in a common area. We’re happy that you enjoyed your stay! We’re thrilled that you had such a pleasant stay with us! We're very sorry for the noise issues you experienced. We hope to have the chance to Make it Right in the future. We're thrilled that you enjoyed our clean rooms, convenient location, and attentive staff. We look forward to welcoming you back! We apologize for any confusion you experienced, and we're sorry to hear that certain aspects of your stay did not meet expectations. We hope to have the chance to welcome you back and provide you with an even better experience in the future. We sincerely apologize for your disappointment. If you have any additional information you're able to share about your experience, please don't hesitate to reach out directly to the hotel. We hope to have the chance to Make it Right. We're so happy that you enjoyed our central location! We appreciate your taking the time to leave a review. We hope to have the chance to welcome you back and provide you with an even better stay in the future. We're very sorry for any inconvenience you experienced. We appreciate your feedback, and will take it into serious consideration so that we can improve in the future. Full breakfast is served daily from 6 AM to 10 AM for a fee. Urban Tavern - Restaurant and bar specializing in American cuisine. Open daily for breakfast and dinner. Herb N Kitchen - Coffee shop specializing in American cuisine. Open daily for breakfast, lunch, and dinner. Cityscape Bar and Lounge - Rooftop bar. Open daily. Lobby Bar - Lobby lounge. Open daily. Recreation features at Hilton San Francisco Union Square include an outdoor pool and a 24-hour health club. The front desk is open 24 hours a day, and checking out is easy with express services. Driving? This property offers parking (fees apply), along with a car charging station.